- Stepless speed adjusted by frequency converter, allowing easy control. - 2l or 4l grinding barrel is equipped with barrel cover to prevent materials from splashing in the course of dispersing. - Various dispersing disc are available for choice. Vortex mixer : Adjustable speed, Vortex genie short, rapid, eccentric stroke motor ribin neoprene cup imparts vigorous agitation to tubes. With speed control indicator and on-off switch. The MiniMix® 100 is designed for the blending of small samples. 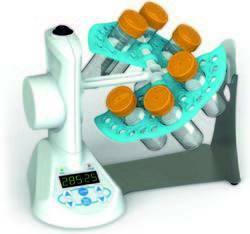 Thanks to the adjustable addles, your blending is more accurate and effi cient. - Brushless DC motor for quiet operation and maintenance free long operation. - Microprocessor controlled unit with digital display.